After a multi-day trip to Oklahoma for a funeral, we got back to find that the wiring connecting us to the net was fried, which meant another couple of days getting it fixed. I'm online again, but it will be a couple of days to wade through a week's worth of email plus handling the everyday things that accumulate when you're out of town. I should be functioning again soon, but I thought I'd post a quick note to explain the long radio silence. "I'm getting myself an eleven foot pole, custom made." "Strip down the elves and cover them with oil. I want to push all those levers." 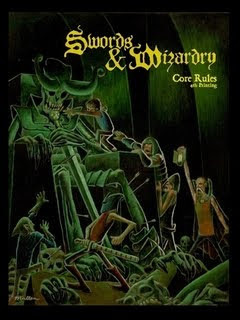 Several people have told me that they prefer the original title font that was used on the covers of the earlier printings of the Swords & Wizardry Core Rules. The reason for ditching the original font was because Blackletter fonts aren't good for off-the-shelf sales if the book goes into distribution. 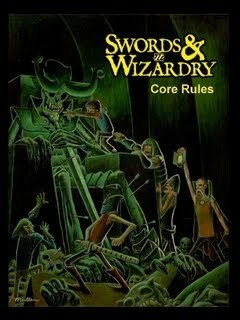 Since, if Swords & Wizardry goes into real distribution, it would be the Complete Rules, that issue doesn't exist any more. So, for those who really, really want that original title font on the cover, I have put up a retro version of the book with the original title font. It's the same interior as the regular 4th printing -- the only difference is the title font. It is only in hardcover, and has the same price as the regular hardcover. A peaceful tribe of nomadic wood-elves suddenly becomes hostile and starts raiding human settlements with murderous zeal. Investigating this sudden change of heart, the heroes discover that the tribe has abandoned its traditional nomadic lifestyle to take up residence inside a famous feature of the local landscape, the Hollow Mountain. The Hollow Mountain is a very sharp, lone mountain that sticks up from the dense forests of the region like a rotten tooth. It derives its name from the fact that it is almost completely empty inside. On their way to retaliate against the elves and rescue the prisoners, the PCs learn that plants and sylvan creatures in the area are being corrupted by some vile influence that must be destroyed before the whole forest turns on its inhabitants. As they proceed closer to the Hollow Mountain, the PCs encounter strange and hostile creatures; something is indeed terribly amiss. Once inside the mountain, the PCs must brave cave after cave of different misshapen enemies, mutant elves and their animalistic masters, prehistoric plants and monsters until, at the top level, they pass into a nightmarish planar pocket through a portal opened ages ago by the highly-advanced lizardfolk who once occupied the hollow mountain and experimented with powerful magic that proved to be their undoing. There they face the unlikely master of this insane unholy war, “the tree that sees”, a tree-like aberration from before the dawn of time that threatens to spill its madness into the PCs’ world. 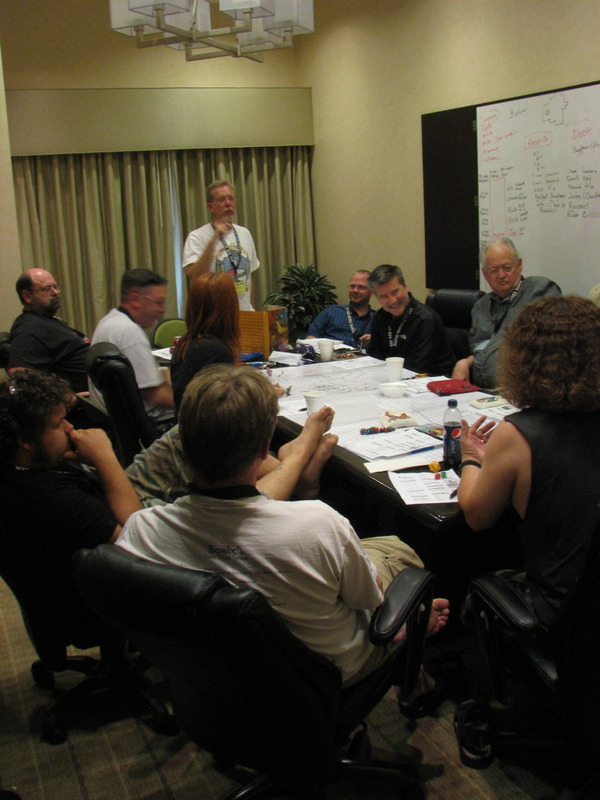 As a matter of interest, Bill Webb attended PaizoCon over the weekend, and apparently sold quite a few Swords & Wizardry rulebooks. He didn't bring any of the Swords & Wizardry modules because of the risk of accidentally selling a S&W module to a PF buyer (the covers are virtually identical), but the rulebooks did pretty well in an environment where one wouldn't necessarily expect them to sell well. He also ran several gaming sessions of Swords & Wizardry (32 hours, IIRC from the phone conversation), and they were all packed. It goes to show that there is considerable interest in the mainstream gaming community about the old school games. This has always been one of my goals with Swords & Wizardry, to provide the more open-ended old school game to newer gamers who started gaming in an environment where the broader-scope rules are simply the only option assumed to exist. That plan seems to be finding an audience, although it's a slow process. Anyway, this post is probably of fairly little interest except to those of us who are interested in growing the hobby (as opposed to those who just play, which is what it's really all about). But since there are many of us who, in addition to playing, are also interested in spreading our approach to gaming, I thought it would be of some interest. Another point -- kudos to Paizo for not being jerks, because they certainly could have boxed out any other games at their con. It is, after all, their convention. I know it's because they aren't threatened by the whole old school thing, but it was still nice of them. Valley of the Hawks is the first Hex Crawl adventure/setting by John Stater for Swords & Wizardry, published by Frog God Games (link here). It's $4.99 for the pdf or $9.99 for the printed book/pdf. So far I don't have any links to reviews, because the only physical copies out there are the ones that were sold at NTRPGCon. The Valley of Hawks is a wooded river valley that cuts across a verdant prairie. It is named for the giant specimen of hawks that hunt along its banks and, during the Spring, blacken its skies. In the days of myth and legend, the Valley of the Hawks was inhabited by a race of giants who carved their likenesses in stone and hunted monstrous creatures using the giant hawks as their ardent companions and helpers. 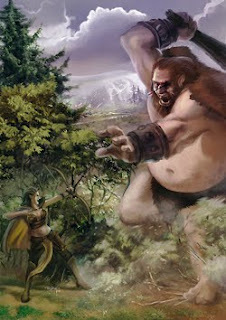 In the shadow of the giants dwelled the trouping elves and their erstwhile goblin enemies, fighting and feasting and making sport of life. The coming of the golden men from the west sent the proud elves and vicious goblins into hiding, for they commanded powerful magics and built a grand city of metal and crystal. But the reach of the golden men exceeded their grasp, and within a few generations their city had fallen and sent its children into the valley as orphans, and the elves and goblins worked their vengeance on them until only a few bands of the golden men, as wild and savage as the beasts, still roam the Valley. And so our adventurers arrive in the Valley of the Hawks seeking fame and fortune. Perhaps they come from northern lands or southern lands or perhaps they were born in the Valley and seek to learn its secrets and use its wealth to found a new city in the manner of the long gone golden men, a city that shines and terrifies and engraves their names forever in the stories of elves and men. Joe Browning made an interesting post here on the topic of dungeon design, and I posted a response -- which was promptly gobbled up by the internet and disappeared. What I wanted to say was actually a bit off topic from Joe's post in any case. His point was that as a matter of realism, dungeons would be built without the sort of multiple-entry, circular-pathway, multiple-connection design that is the "conventional wisdom" of megadungeon design. The only real part of my lost response that I'll rewrite is the point that designing a good tactical environment for gaming trumps the desire for realism in designing the area. I'm not dismissing Joe's point, I just think that there's another layer in addition to what he points out, and that I think the second layer is actually the more important one. But the second point I made, and the one that I'd like to develop somewhat more (ie, what I'm willing to re-type from the lost post) is that most of the canon wisdom Joe points out is addressed to designing megadungeons -- and does not apply to adventures that take place in a smaller area with a defined mission. Megadungeon canon is specific to maintaining many possible routes and presenting the players with a multiplicity of options to go through a large area. Lairs are entirely different, and indeed many of the things that are specifically "good" for megadungeon design will cause problems in a shorter and more defined adventure. Multiple pathways? Better keep the number limited, or the party may get lost and sidetracked through no real fault of their own. The potential for bogging down increases -- there is an optimal number of pathways through a lair that is far, far smaller than what you'd want in a megadungeon. Lairs needn't necessarily be linear, but the design of the tactical space needs to be focused upon the adventure's objectives. 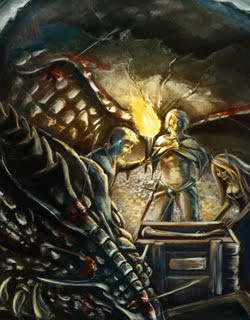 For a megadungeon, that's exploration, but for a lair it is accomplishing a specific objective that's (usually) been set in the adventure rather than by the players. For a lair, I would say, the different tactical pathways should contain some sort of circular route for potential backtracking, but clear dead ends are just as valid. Also, the backstory of a lair is infinitely more important than it is in a megadungeon. One of the things a short adventure should do is to clear up pretty much all of the mysteries (except, perhaps, a mystery that creates the bridge to the next potential adventure). Lairs have a stronger emphasis on fact-discovery than on terrain-discovery. Lairs can certainly be straightforward without a COMPLICATED backstory, but if the party defeats the monsters and finishes the area, they should pretty much understand what was going on there. Thus, in terms of the structure of the map, it can be seen not just as a tactical map but also as the floor-plan in which facts or clues are located. Possibly they are scattered, or possibly there's just one big final revelation if you can get to the "last room." I don't think that I can really resolve these thought into any set of rules, but it's worth thinking about the fact that whatever "rules" there might be for designing a small dungeon or a lair would be considerably different from the design principles used in creating a dungeon that's intended for unlimited repeat visits. 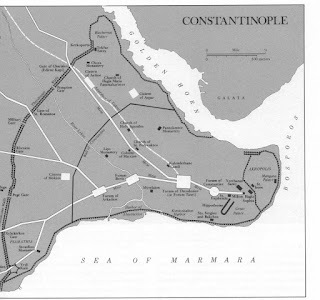 My job for today is to finish my article for Knockspell Magazine on Constantinople as the source for a fantasy city. It's going pretty well, with a summary of pre-Roman history, then a timeline running from Constantine's elevation of the city into his Imperial capital, and then sections describing the most interesting elements of the Medieval city rather than tracking the history itself. For purposes of creating a fantasy city, it's the themes rather than the linear history that will be the most important creative tool for a Dungeon Master. Some time ago I started taking notes on Constantinople after reading the novel "Sailing to Sarantium" by Guy Gavriel Kay, which I highly recommend. Since the main city in my campaign is "Cyprandium," it's all grist for the mill. I'm filling in the gaps in those notes and turning them into an article with some commentary about how one might choose to employ the various elements in terms of gaming. I am not, however, focusing very much on how the city would "logically" change as a result of being in a world where magic is more or less common, since I think all Dungeon Masters tend to apply that kind of logic to a very differing degree, and also make their cities at very different power levels. Anyway, that's the task for today. That's me on the chair, and then to my left (viewer's right) there is DungeonDork, Erol Otus, Dennis Sustare, (then about 3-4 people out of the frame, from the unseen Marshall Mahurin until you get over to Austinjimm), the back of Austinjimm's head, the back of Bill Webb's head, ANGRYWIZARD (feet on table), the back of Ala's head, Rob Badolato (Badmike's brother, playing a hobbit thief), and John January. Thanks to Bill Barsh for snapping the picture! I think this was during the battle in the interdimensional pirate ship sunken on the 4th level, where an evil voodoo-undead box with minions was fought with all kinds of awesomeness, including cannon-fire from one party member into the middle of a melee, hobbits swinging on ropes with a charmed bugbear (and later with the evil undead-thing clinging to the bugbear's ankles toward the end of the trajectory) collisions with invisible characters running with open oil flasks, a character turning into an undead-minion-thing during the battle, etc. It ended with the ship returning to its natural state, so old that the wood is petrified, rising up incorporeally through the earth to settle on the ground near the dungeon entrance with the party still aboard. Plans are underfoot to turn it into an adventurers' tavern with the bugbear as bartender. Apparently people on my address book are getting emails from me with no subject line, containing a link. DO NOT OPEN THAT LINK! My address book is on Yahoo, so I don't know how it got hacked, but until I can make sure that I don't have a virus (McAfee says no, but obviously something happened) do not even open an email from me that has no subject. Cool stuff about NTRPGCon later, but I wanted to warn people -- I just discovered this. Edit - yes, it was that someone cracked my Yahoo password. [picture of scrambled eggs removed because it was pulling egg-related traffic instead of gaming traffic. Not being one of those lucky laptop people, I won't be blogging during the con unless somebody leaves a laptop unattended during breakfast and I have the chance to type really fast before they come back with their muffin and yogurt and chase me off. Muffins and yogurt bring me to an important second topic that needs to be addressed before I depart tomorrow morning. If I have one piece of advice for convention goers this year, it is this: beware the eggs. I'm not sure if it's a different hotel this year, but the scrambled eggs from last year no doubt still remain in the minds (and possibly the intestines) of last year's convention-goers.